The following statement was issued today by the Syrian Democratic Forces, a coalition of anti-ISIS armies led by the Kurds (YPG/YPJ). 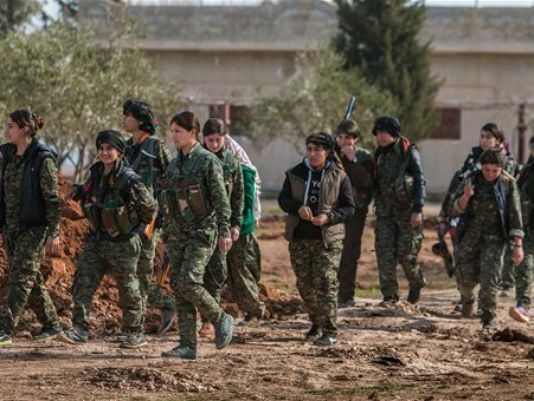 KOBANE, ROJAVA, Syria (December 23, 2015) – The Syrian Democratic Forces (QSD) which embraces all components of a free Syrian society has been established in order to unite all Syrians, put an end to the volatile situation in the country, and lead a strong strategy to liberate Syrian soil, with the intention to provide the people with a deserved protection in face of terror and oppression. Our aim is to create a democratic and a bilateral Syria, where true just is implemented over time, and people’s honor are protected, a country where everyone could enjoy their legitimate rights, and freely practice their part in the public with respected concepts and identities. We are in the midst of important developments occurring on the ground in Syria, from growing international and regional interventions, to those many terrorist groups seeking to benefit from the increasing instability to endorse their own interests. Despite these challenges that exist in our region, as the Syrian Democratic Forces we must continue the struggle against terror and oppression until realizing a free and just Syria. We had earlier promised to thoroughly cleanse Syria from the existence of terrorist groups, and liberate our fellow Syrians from tyranny. In light of that, for successful advances achieved in the southern portion of Hasakah region to be persistent on the basis of our strategy, we announce the endurance of the QSD military campaign in the context of liberating our country from terrorist activities. We are confident that our actions in securing those objectives will produce constructive outcomes in the coming days. Today, December 23, we declare the beginning of our joint campaign in the rural district to the south of Koabne region. This operation will be persistent until clearing all areas in southern Kobane that have been occupied by elements of the terrorist group known as Daesh (ISIS), as well as building up a sense of peace and security in the cited region. We call upon all Syrian people, especially the local population in southern Kobane to stand in support of our units who have joined their devoted efforts to liberate their people from terrorist threats. The Syrian Democratic Forces are your national force, for that, assist them and join the cause. This entry was posted in Resistance, War and tagged Kurdistan, SDF, Syria. Bookmark the permalink.